This week a very small thing happened that made me sad, and then it made me quite angry. Someone posted a judgmental comment on my Instagram! Don’t worry, this happens all the time. Mostly I laugh, and show my friends. Sometimes I troll them and write something dumb on their Instagram. Usually I just ignore it and feel mildly flattered that people take the time to comment on my photos at all. But I really hate when people criticise others (period) but more specifically when they bring judgment to an aspect of that person’s lifestyle choices, when that person is obviously making a conscious effort and doing what they can already. It doesn’t achieve anything except encourage that person to become defensive, and usually to defend their actions even more than they normally would. I’ve noticed ever since that this kind of thing isn’t confined to veganism or just dietary choices; it transcends every social choice we make. In case I’m not make sense here’s an example – if someone talks about how they’ve started recycling and how it is easy and everyone else should too, there is always that person that points out “Well you use a washing machine which is a huge waste of water resources!” What? Why does one thing cancel out the other? Why must making the decision to recycle suddenly transform someone into an environmentalist responsible for every aspect of their lives having a negative impact on the planet?? This happens when I say I am a vegetarian all the time. “But you eat yogurt. And eggs.” “But you eat tofu made of soybeans which means you kill monkeys living in the rainforest.” “But you use dishwashing liquid so you kill sea life” and the list continues. This kind of thing is so unproductive I almost can’t give a polite reply anymore. I really care about animals. I mean I really care. I rarely have to justify it to the people I know because it’s obvious. I see those ads on the back of buses protesting against live animal export and I cry on the street like a baby. But I never ever look down on my friends and family for eating meat, or buying leather, or any decisions they make. Why? Because it isn’t my place, and it achieves nothing. It reinforces the stereotype that vegetarians and vegans are extremists and should therefore be silenced or ignored. I believe that if the people I care about, and the rest of the world for that matter, properly understood how cruel and self-serving the meat production industry has become, they would give up meat in a heartbeat. Wilful ignorance is probably the most dangerous thing our generation possesses, because it affects all of us on so many levels. I’m guilty of it myself. I know in my heart of hearts that eggs come from chickens, and yes I only eat free-range organic, but there’s still hundreds of male chicks bred each year for laying purposes that are killed. The only thing that can actively change people’s minds isn’t judgment or criticism, it’s education. When systems of cruelty and oppression are properly exposed, 9 out of 10 times people will find they cannot live with the knowledge that they are an active and thriving part of that process. I don’t eat meat because I am fully aware of the cruelty animals are treated with in the meat industry, and I can’t justify it to myself anymore. Sometimes I wish I could just scream this at people to see what is staring them in the face, but I don’t. They would think I was crazy! Instead I try and educate them – recommend books, movies, explain the truth behind the industries at work. I never pass judgment because it just shuts people out, which is exactly what happened on my Instagram. I didn’t agree with the comment. I didn’t stop eating eggs, instead I felt insulted and riled. I didn’t think about what that person was trying to say, which is that the egg-laying industry is poorly constructed and impossibly cruel to chickens. Something I identify with! If they had started a discussion and explained why they don’t eat eggs, things could have turned out differently than how they did. Have a lovely week everyone!! 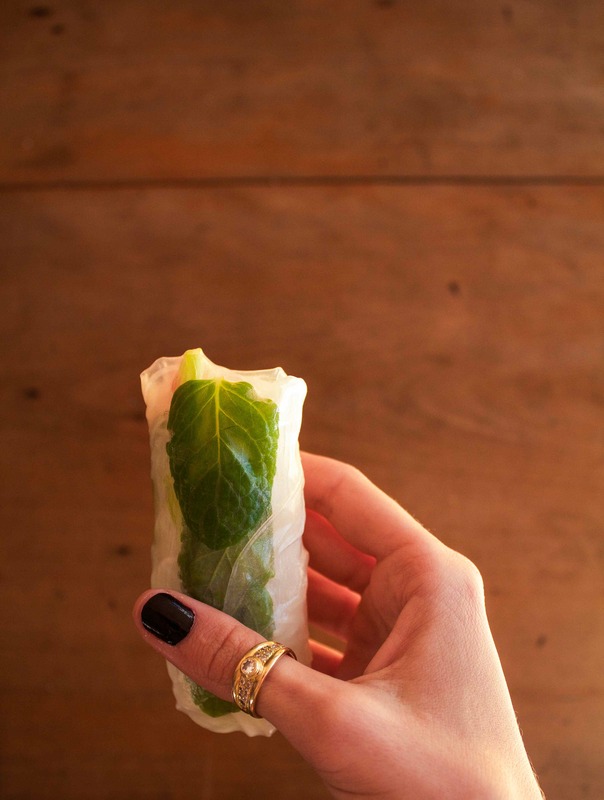 PS I made rice paper rolls inspired by My Darling Lemon Thyme and they are delicious! 1 shallot strip, thinly sliced. Place the carrots in a small bowl and mix the vinegar and water together. Pour over the carrots and leave to pickle for at least 20 minutes. Shallow fry the tofu strips in the chilli oil until golden on each side. 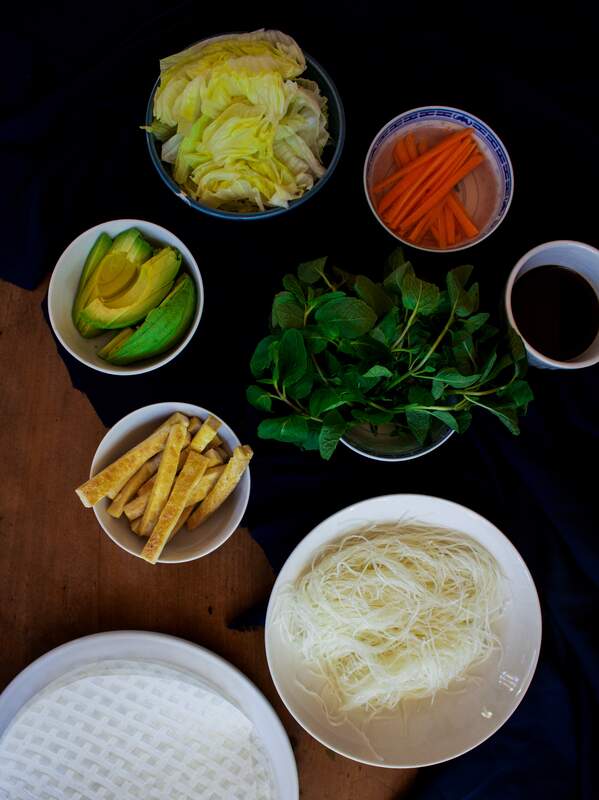 Cook the vermicelli according to packet instructions. Have all your filling ingredients at the ready! Place three plates out in front of you, and all your bowls of filling in front of that. 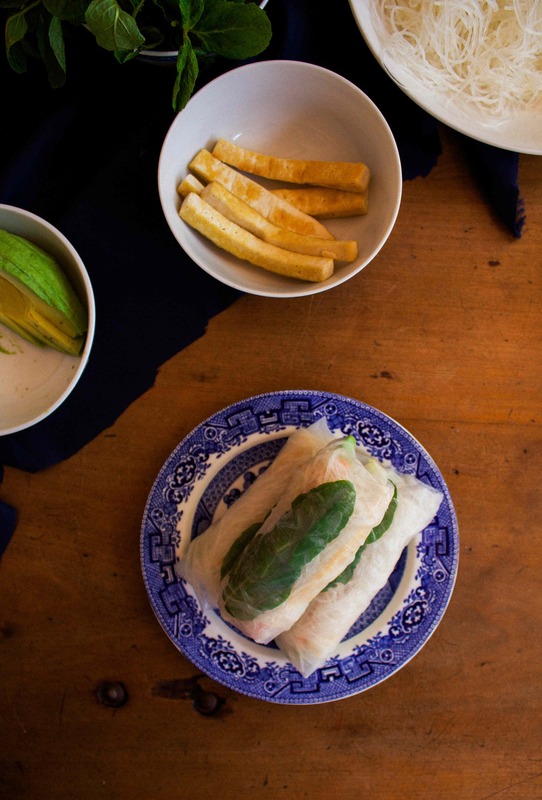 In the plate on the far right, boil a kettle of water and pour enough water in so that the plate isn’t overflowing, but you can submerge a rice paper sheet. Gently dip the sheet under the water, using your fingers to stop it curling in on itself. Once dunked transfer it onto the second plate. 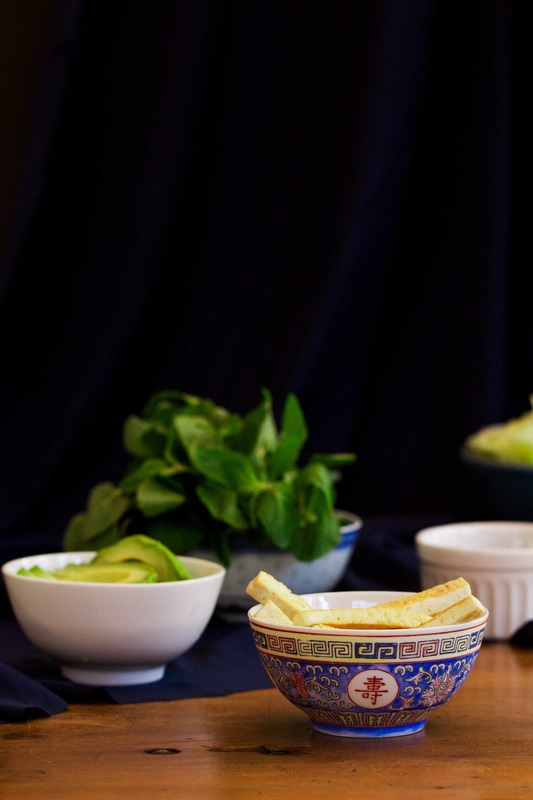 Lay a few sprigs of basil and mint in the centre of the paper, followed by a small tangle of vermicelli. 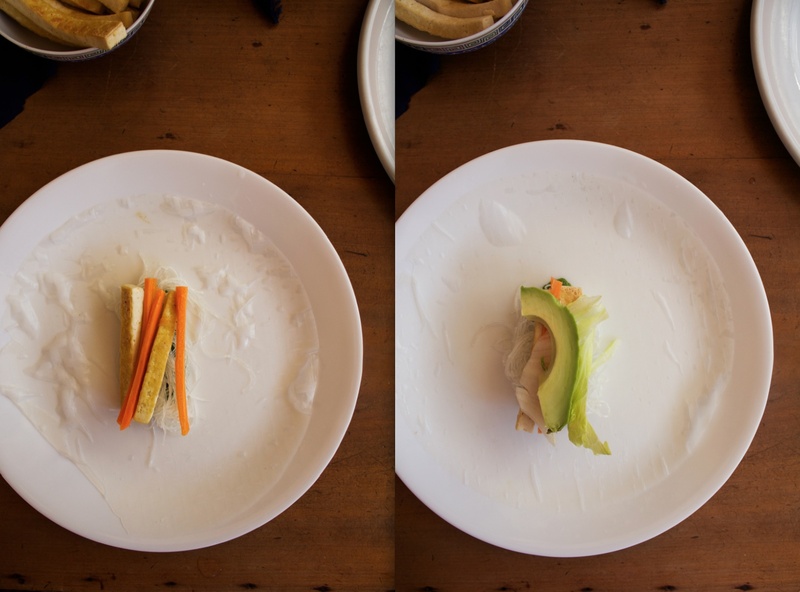 Lay a strip or two of tofu, two pieces of carrot, a piece of avocado and some lettuce on top. Take up the bottom of the circle closest to you and pull half way up over the ingredients. Keeping it in place with a finger, take the top half of the circle and fold down to cover the rest of the ingredients. Peel the left hand side of the circle firmly up and pull tightly to the right, over the ingredients. 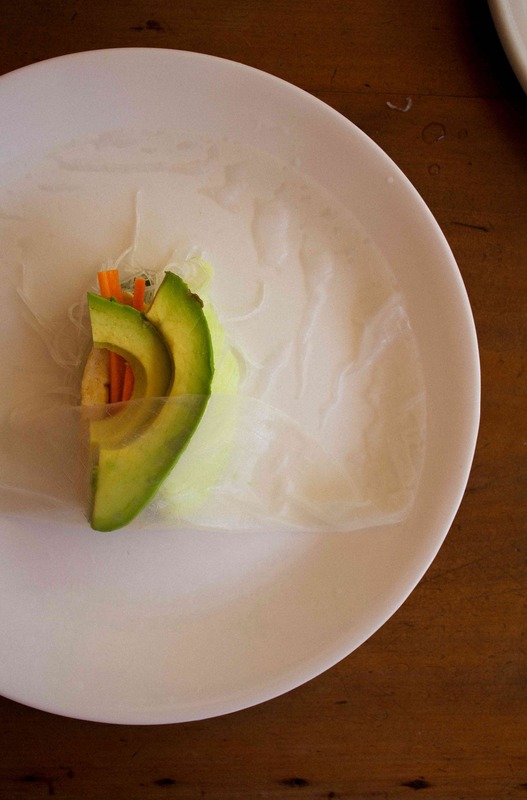 Now continue to roll the roll towards the right, until the rice paper roll is completely rolled. Place on the plate far on the left and repeat with the remaining ingredients. Makes about ten. enjoy them fresh! This entry was posted in gluten free, Healthy, savoury, sugar free, Uncategorized, Vegan, Vegetable dishes. Bookmark the permalink. Just wondering if you know that you can block people on IG? I find that the anonymity of the internet allows people to behave selfishly and mannerlessly – in a way that most wouldn’t dream or have the courage to in person. Ignore, ignore, ignore and BLOCK!! Life is too short to waste energy on trolls and do-gooders. I recycle, use a washing machine and a dishwasher, shop local and give all our old/grown-out of clothes and shoes to charity. You do what you can do! Firstly, these crispy chilli rolls look absolutely divine- I love the pictures on your instagram! I cannot wait to try the recipe, Lilli! I think it sad when people have to be super negative to others over the internet. Only the other day, I got a really horrible comment from someone who tried my recipe and she started to complain about how it didn’t taste right. Aw thank you Jess! I get so many of those comments where the recipe didn’t work right for them. It always gets me down because I feel like I’ve failed them! All your recipes look so delicious though 🙂 I would blame myself if something didn’t taste right! Totally agree people can be cats. No offence intended to any cats. Oh wow I guess they didn’t know plants have feelings, just like animals and don’t want to be eaten either! Well at least you stood up for yourself, there are so many labels people put on others it gets crazy!!! It’s sad alright. Btw. I posted my rice wraps the other day and having seen this post, I should have turned it into one of those comedy ” nailed it” images lol. Your wraps look spectacular. Understandable that you were riled. You have such a gorgeous blog full of amazing recipes, beautiful photographs and it represents who you are, a caring soul who is thoughtful about the food choices you make, which is very admirable. 🙂 I must make these rice paper rolls. I actually crave these and am usually disappointed when I order them out. Well said, Lillith. I really liked the way you wrote the post. It’s sad to see people being so judgmental about other people’s life choices and they clearly didn’t have the right to make you feel bad about your choice of eating eggs. I myself am not a vegetarian (I’ve tried to and it just doesn’t work for my health/anxiety/etc), but I do enjoy eating mostly plant-based and I definitely respect vegetarian and vegan beliefs. Which I cannot stand are those kind of vegetarians trying to convert everybody by critisising their choices. Yes, I agree that the world would be a better place if we all could give up animal products but bullying non-vegans and making them feel bad about their choices isn’t the way to go! Hi love. I’m so sorry about that instagram experience. I have had similar things happen. It can be upsetting. But thank you for continuing to share with us. Your honesty, words, and recipes are always so refreshing. Thank you for sharing! Jeeze – it would be easy for me to spew sharp criticism in reaction to such simple-minded criticisers. But then I would 1. put the spotlight on what was said 2. behave in the same limited fashion. I have no intention of putting any energy there, so I will not waste another word on what was said . Instead: I find it inspiring that you share such healthy and delicious recipes (and with that a positive mindset) – I love reading your posts and your recipes exactly because you are not dogmatic or rigid! Thank you afra! I would absolutely hate if this space get became dogmatic or judgmental in any way so that is so good to hear! Thank you Bonnie! Yeah I did write a response saying “I’m not actually vegan” and they responded in turn quoting stuff I’d said in the past that suggested I was vegan…which I thought was very rude! I wrote a pretty abrupt comment back asking them not to bring judgment to my instagram space because we were all like-minded people with the same good intentions, or something along those lines. Needless to say she didn’t reply! I think it’s true the more you put yourself out there and be true to yourself the more people are going to react negatively as well as positively. That’s my favourite bowl!